On November 6, Americans voted on a broad assortment of tax measures and bond proposals — many of which were focused on funding for transportation and outdoor recreation. What do the results mean for bikes? U.S. voters approved legislation that will commit nearly $2 billion to bike projects during the next decade. PeopleForBikes tracked 11 state and local ballot measures and propositions related to bike funding. 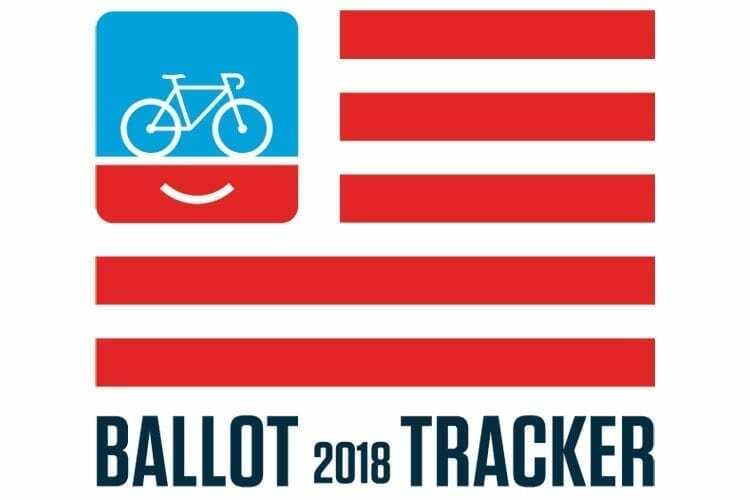 ViewPeopleForBikes 2018 Ballot Tracker to read about all 10 bike victories. On November 6, Californians rejected Proposition 6, a ballot measure that would have pulled back billions in funding for critical transportation safety and maintenance projects already in progress. California will continue to invest an additional $100 million per year in bike and pedestrian projects. Bike riders will continue to benefit from legislation that doubled the size of the state’s bicycle and pedestrian fund from $100 million to $200 million per year. If Proposition 6 had passed, that funding increase would have been eliminated. In Florida, a Sarasota County bond measure to extend a rail trail passed 71% to 29%. Georgia’s Outdoor Stewardship amendment passed, with 80% of voters in favor. This amendment directs the existing sales tax on outdoor goods (including bikes), to parks, trails and conservation. Bond measures to fund parks and transportation — including bike lanes, greenways and trails — passed by large margins in Austin, Texas (81% of voters in favor), and Rhode Island (79% of voters in favor).